The National FFA Organization was charted in 1935. ​"Learning to Do, Doing to Learn, Earning to Live, Living to Serve"
FFA is an inter curricular program offered at numerous high schools, and some middles schools, in the U.S., Puerto Rico, and the Virgin Islands. FFA has a wide variety of different ways be intertwined in the world of agriculture; from showing animals, to growing plants, to many other activities depending on your chapter! 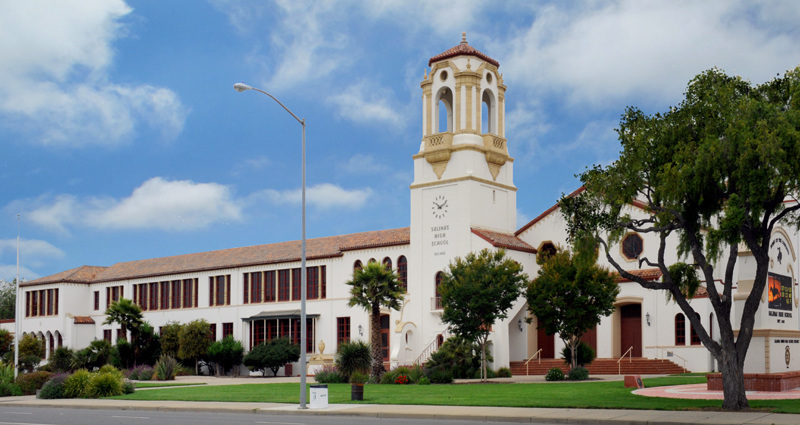 Salinas FFA is located at Salinas High School in the heart of the "Salad Bowl" of the world, the Salinas Valley! Our chapter has over 300 members and has a variety of different things to engage in. How to become a part of FFA? "How do I join FFA?" you may ask, well all you have to do is enroll in an Ag class by talking to Ms. Martinez and your counselor. If you are already in an Ag class, then you are already enrolled and all you have to do is get involved! Our chapter offers many activities to get involved! We have a livestock show team, an opening and closing team, Job Interview CDE, and the opportunity to compete in FFA public speaking competitions, etc. If you are interested in any of these activities, or want to learn more about them, contact us!